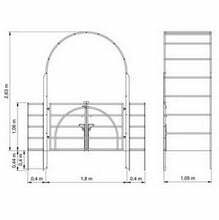 Bespoke Roman Arch with Arc Gate & Estate Fencing design, exclusively manufactured by Harrod Horticultural. 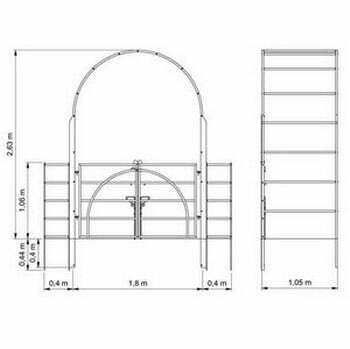 The Roman garden arch is our most popular design of metal garden arch and it is easy to see why, with its clean, simple lines this strong steel metal garden arch creates a stunning focal point around the Arc design gate, framed with estate fencing either side to create a perfect elegant entrance. The Arc design gate is a stylish and practical addition to any garden, whether used as a stand alone feature or combined with our estate fencing. 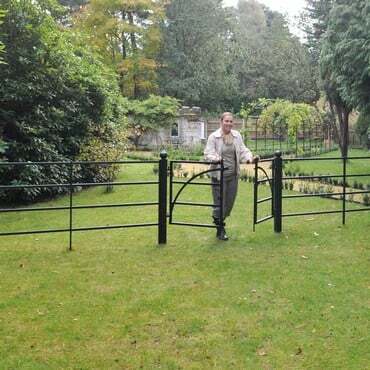 The gate is made to last, using fully galvanised steel, powder coated black for a long lasting, maintenance free finish and comes complete with a 10 year guarante. The 2 door gate has an attractive arc detail and features a latch, drop bars and drop socket tubes. The stout 75mm square gate posts come complete with a decorative ball finial for a sophisticated finish. 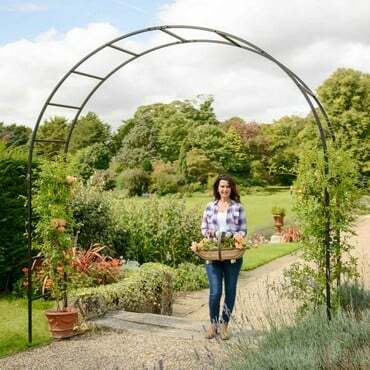 The Roman Garden Arch is our most popular design of metal garden arch and it is easy to see why, with its clean, simple lines this strong steel metal garden arch creates a stunning focal point around the Arc design gate, perfect to frame an entrance. 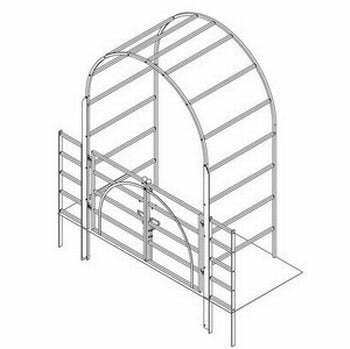 Our Roman Garden Arches combine our own manufacturing excellence with a design which is definitely 'tried and tested' resulting in metal garden arches incredible in both simplicity and looks. The semi-circular span of the Roman Arch is particularly suited for climbing ornamentals, vegetables, fruit trees and often used as rose arches. With the top quality materials used in this steel garden arch, you can be sure it will be around for years! As well as the pre-galvanised extra strength 1.5mm thick x 25mm square steel with a matt black powder coated finish, the RHS endorsed Roman Arch boasts flush fitting plastic-capped steel connectors and black stainless steel bolts. 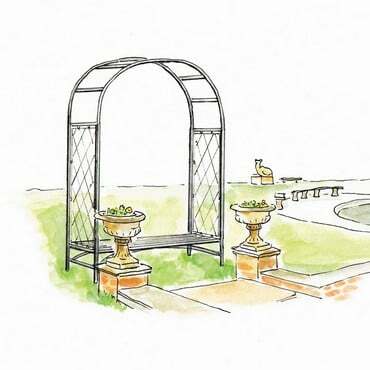 The Roman metal garden arch is designed to be installed directly into the soil so we've provided an additional 40cm on each upright to secure into the ground. 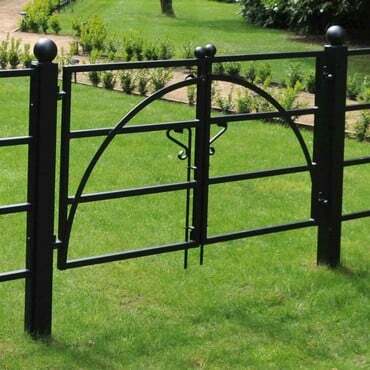 The estate fence is exclusively designed and manufactured by us in the UK, made using fully galvanised steel, powder coated black for an attractive, long lasting and maintenance free finish. The extra strength upright posts are flat steel bars, 40mm x 12mm, and stand 1m out of the ground with allowance for 0.5m to be inserted into the ground - for maximum stability we advise that the uprights are concreted into position. The heavy duty steel cross bars are 25mm square and are spaced 25cm apart.